Want to know where your seat will be located before making a purchase? 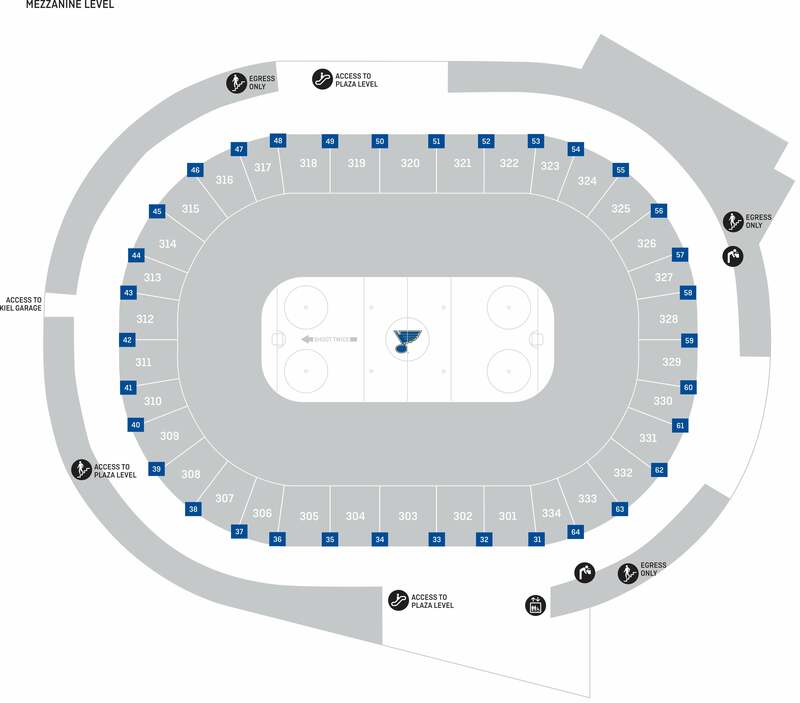 The information on this page will help you understand how each level of Enterprise Center is configured and where your seat will be located. Use the link below to access our seating locator for a better view from your seat. The side sections are 101-105 and 114-118. The rows in the side sections run from “A-W” followed by “AA-HH”. The end sections are 106-113 and 119-126. The rows in the end sections run from “A-W” followed by “AA-KK”. Entry to each section from the Plaza Level is at row “R”. Wheelchair or disabled seating is in row “R”. The side sections are 301-305 and 318-322. The end sections are 306-317 and 323-334. The rows in the side and end sections run from “A-R”. Entry to each section from the Mezzanine Level is at row “C”. Wheelchair or disabled seating is in row “C”. Some events at Enterprise Center may make use of General Admission, or GA, seating. In these configurations, no chairs will be placed on the floor and guests will be permitted to stand on the arena floor where room allows. For GA shows, a first-come, first-served wristband policy may be put into practice. Please check individual event pages for more details as they pertain to each show. Floor seating for concerts and other floor events (such as some stage shows, wrestling or boxing) varies greatly depending on the stage (or ring) placement. 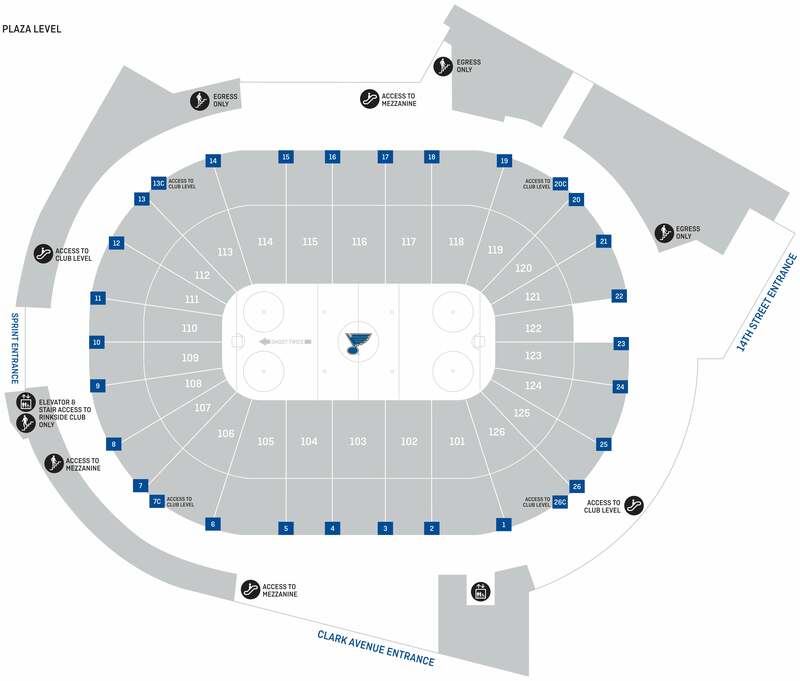 The stage for most concerts and other stage shows is typically located at the east end of the floor near sections 120-125, facing toward sections 106-113. Wrestling and boxing events typically use a center ring; some concerts use a center stage configuration as well. Floor seating sections are labeled by single letters of the alphabet (i.e. “A-G”). Floor seats are padded folding chairs and are all on a flat floor level, not tiered, and are numbered from right to left when facing the stage. There are no rows with the following letters: I, O, X, Y, Z, II. Seats in all rows are numbered left to right with seat number 1 located closest to the preceding section. 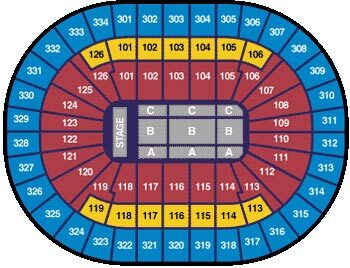 For example, seat 1 in each row of section 102 is closest to section 101.